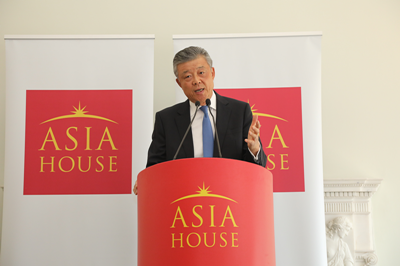 It is a great pleasure to be back in Asia House. Lord Green asked me to talk about China-US trade dispute. This is a really hot topic which has attracted much attention lately. Two days ago, Vice Premier Liu He visited the United States as Special Envoy of President Xi Jinping. Following constructive consultations between Vice Premier Liu and his US counterparts, a joint statement was released last weekend. continue to strengthen cooperation on intellectual property protection and two-way investment. The most significant outcome is obvious: China-US consensus dispersed the dark cloud of a "trade war". For the peoples of both China and the United States, and for all those who have been concerned about how the trade disputes might evolve, this is really a good news. First, this outcome is what Chinese and American people want. It is what a sound China-US economic and trade relationship needs. For China, this outcome is in the interest of achieving high-quality economic development and meeting the growing consumption needs of the Chinese people. China will continue to open up, and in this process press ahead with reform and seek further development. For the United States, this outcome will help cut trade deficit and support growth and employment. Second, this outcome is conducive to global economic and trade stability and prosperity. Trade consensus between China and the US, the two major economies in the world, is welcome news to all. As I have said on many occasions, there is no winner in a trade war. In this latest consultation, both China and the United States demonstrated the responsibility of major stakeholders. This outcome is certainly in the interest of safeguarding international trade order and promoting a healthy world economy. Third, this outcome highlights the importance of persistency and perseverance in maintaining sound economic and trade ties between China and the US. There is no doubt that sound economic and trade ties between China and the US serve the interests of both countries and conform to the trend of the times. Yet, Rome is not built in a day. Resolving the accumulated systemic trade issues calls for unremitting efforts. This outcome shows that the two countries will stay in close consultation and effective coordination to build on this consensus. In the years ahead, they will be capable of remaining cool-headed in face of any potential problems and difficulties in their relations. This will enable them to see the big picture and sit down, talk and find an appropriate solution. The danger of a China-US "trade war" has abated. But the deep seated issues underscored by this round of trade dispute deserve some deep and serious thinking. The latest consensus has temporarily put the trade disputes to bed. But to prevent the spectre from rising again, we must identify the crux of the issue and administer the right remedy. To this end, I would like to share with you my four suggestions as food for thought. My first suggestion is to stop being suspicious about China and see the big picture of China's development in an objective light. This year marks the 40th anniversary of the introduction of reform and opening-up policy in China. This policy has led to huge progress in China and the world. For China, reform and opening-up is a road to development that is in line with its national conditions. It has led China to become the second largest economy, the largest industrial country, the largest trader in goods and to have the largest foreign exchange reserves. And it will lead China to shift from high-speed economic growth to high-quality development. This means China will rely on reform to create better quality, higher efficiency and more robust growth drivers. And on this basis, we are aimed at building a modernized economy, enhancing total factor productivity and strengthening innovation and competitiveness. For the world, China has been a major opportunity for common development as it deepens reform and opening up and its integration into the current international system. China has been a stabiliser and powerhouse for world economic growth. For years, China has continuously contributed over 30% of world economic growth. In 2017, China invested $124.6 billion overseas. Chinese companies paid over $30 billion in tax and fees to host countries, and created 1.35 million jobs locally. These are huge boosts to the local economy and life-changing for the local people. As has been over the past 40 years, China will continue to take opening up as its basic policy, increase connectivity with world, and promote common development with international partners. A series of major and further opening up measures have been or are being implemented. These will bring more opportunities to all the countries in the world. Demonising and imposing restrictions on Chinese investment could poison the business environment and hamper the sustained growth of the host countries. I must also stress that China remains the biggest developing country in the world. We have our share -- quiet a big share I must admit -- of problems and challenges. Therefore, as far as reform and development is concerned, we have our work cut out for us. But this also points to enormous potential and space for improvements. Moreover, it means that China will continue to press ahead with reform and opening up in its own time. This process will not be held up or spurred on recklessly under pressure. China wants to develop but does not deserve to be seen as seeking to replace or pose threat to anyone. China will become more developed, but this will not in anyway change our determination to always safeguard world peace, contribute to global development and uphold international order. China does not identify with the theory that "power leads to hegemony". We deplore the logic of power politics. We despise the practice of "beggar thy neighbour". And we detest acts of bullying. My second suggestion is, to deepen cooperation with win-win results in mind rather than the belief in "I win, you lose". In the world today, the interests of all countries are becoming deeply intertwined and inseparable. No one can afford to go back into isolation. If you close your door, you are blocking your own way out. If you cling to "zero-sum game", believe that "the winner takes it all" and handle your cooperation with other countries accordingly, you will surely end up weakening the foundation for your own development. This will in turn undermine the common interests of all the countries in the world. China is doing it differently. In our cooperation with other countries, we are always committed to finding and expanding common interests. We do not impose "imparity clause" on others. We do not short change. We are committed to an open world economy. And we are ready to contribute our part to a globalization that is more open, inclusive, balanced and beneficial to all. The road to development and prosperity is never easy. We know that from our own experience. So we wish all countries luck in building a better life, but we do not envy or complain about their success. In the same vein, we hope other countries could join us on this journey of greater openness and connectivity in the spirit of "sharing the load as well as benefits". If China is a fast train to development, then everyone is welcome aboard and take a share of the benefit. In the trade and economic cooperation between China and the US, mutual benefit and win-win results are the stabilizer and propeller. Such cooperation is driven by market forces and should continue to respect and follow the laws of the market in the future. The imbalances in China-US trade must be seen in the context of the international division of labour and industrial and value chains. It is oversimplification, and missing the big picture, to regard deficit as loss and surplus as gain. In Chinese, we call this "missing the woods for the trees". Today, China is working on industrial restructuring to meet the growing consumer needs for high-quality products. We are prepared to import more from other countries including the United States. And we are open to investments from the international businesses including US companies. The US, on its part, should remove the undue restrictions on high-tech export, work on the supply side of its export, and treat Chinese products and investment equally and fairly. That will allow the two countries to match their strengths and achieve win-win results. My third suggestion is to follow international rules rather than domestic laws in handling difference between countries. Differences and disputes are unavoidable in state-to-state relations. China believes that the right way to manage them is to respect each other, follow universally recognized rules and be pragmatic and constructive. However, China will never negotiate away its national interests or trade off its core interests. We uphold multilateralism and the authority and effectiveness of the multilateral system. No one should cherry pick rules. For years, China has steadfastly upheld the authority of WTO. We have adhered to the open, transparent, inclusive, non-discriminatory and rule-based WTO principles. Statistics show that there have been 40 cases against China since our accession to the WTO. During the same period, there have been 80 cases against the United States. Who is a better law-abiding member? Facts speak louder than words. So, the lesson is this: Be more constructive and create an enabling environment for China-US trade and economic cooperation. Last week's consultation clearly shows that dialogue and consultation is the right way to balance the interests and concerns, and to resolve differences, manage disputes and achieve consensus. My fourth suggestion is to recognize China's real progress in intellectual property protection. No gold is a hundred percent pure. No country is perfect in IP protection. The purpose for protecting intellectual property is to encourage innovation and promote development. China has established a complete system of IP protection laws following international practice and in keeping with China's national conditions. There are now intellectual property courts in Beijing, Shanghai and Guangzhou, and specialised IP tribunals in 15 cities. In 2017, there were over 210,000 first instance legal cases and over 40,000 administrative cases involving IP disputes and patent enforcement respectively. The amount of payment in IP royalties to overseas rights owners has increased, from $1.9 billion dollars in 2001 when China joined the WTO to $28.6 billion in 2017. At the same time, China continues to strengthen IP protection and enhance international cooperation. After being a member of WIPO for nearly 30 years, China welcomed the opening of a WIPO office in Beijing in 2014. China is promoting IP protection under the framework of the Belt and Road Initiative and within the BRICS. Not long ago, China and its BRICS partners signed the Joint Statement on Strengthening Intellectual Property Cooperation to boost progress of IP development and protection in emerging economies. 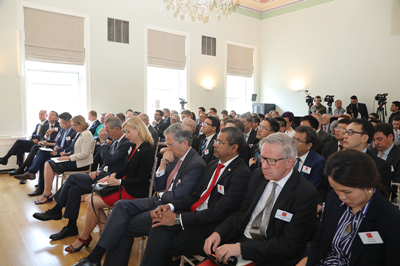 China also holds regular dialogues on IP protection with the UK, EU and US, and signed the Patent Prosecution Highway agreement with over 20 countries and regions. Going forward, China will continue working for a more balanced, universally beneficial and inclusive global intellectual property system. Winston Churchill said, "Those who fail to learn from history are doomed to repeat it." A Chinese idiom goes along the same line. It says, "History is a mirror that reflects the rises and falls of the tide of change." The direction that China-US trade relationship is headed will have a far-reaching impact on the development and stability of China, the US and the rest of the world. It is therefore my sincere hope that with this latest effort of China and the US to solve trade disputes, the voice in favour of multilateralism, free trade and win-win cooperation will grow louder over the clamour for unilateralism, protectionism and "zero-sum game". It is also my sincere hope that following the China-US consensus, international consultation and cooperation will be enhanced and the world economy and trade will take on a stronger momentum. The UK has always been an active advocate for free trade and a firm defender of multilateral trade regime. 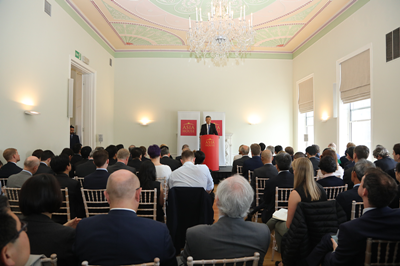 We look forward to joining hands with people from all walks of life in Britain to firmly uphold the multilateral trade regime. Together we can facilitate the sound development of the world economy and global trade. Together we can contribute our part to building a more beautiful future for all mankind. I am ready to take your questions.